^ Viện Sử học, Lịch sử Việt Nam 1965–1975, NXB Khoa học xã hội, Hà Nội – 2002. ^ Jacob Van Staaveren Interdiction in Southern Laos. Washington, D.C.: Center of Air Force History, 1993. ^ John L. Plaster, Secret Commandos. New York: Simon & Schuster, 2004. ^ Fulghum and Maitland, p. 65. ^ Arnold Isaacs, Gordon Hardy and MacAlister Brown, Pawns of War. Boston: Boston Publishing Company, 1987, p. 89. ^ Shelby L. Stanton, The Rise and Fall of An American Army. New York: Dell, 1985, p. 333. ^ Dave R. Palmer, Summons of the Trumpet. Novato CA: Presidio Press, 1978, p. 303. ^ John Prados, The Blood Road. New York: John Wiley & Sons, 1998, pp. 216–320. ^ a b c Fulghum and Maitland, p. 66. ^ Alexander M. Haig, Inner Circles, New York: Warner Books, 1992, p. 273. 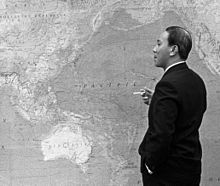 ^ Although technically neutral, the Laotian government had allowed the CIA and U.S. Air Force to conduct a covert war against an indigenous guerrilla insurgency (the Pathet Lao), that was, in turn, heavily supported by regular North Vietnamese forces. Nalty, p. 247. ^ a b Palmer, p. 304. 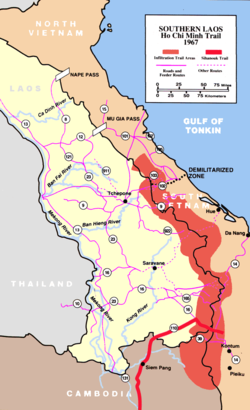 ^ U.S. planners had previously estimated that such an operation would require the commitment of four U.S. divisions (60,000 men), while Saigon would only commit a force half that size. Stanley Karnow, Vietnam. New York, Viking, 1983, p. 629. ^ Fulghum and Maitland, p. 70. ^ a b c Fulghum and Maitland, p. 72. ^ a b Nolan, p. 82. ^ a b c Karnow, p. 630. ^ Sorely, pp. 235, 236. ^ Nalty, Air War, p. 256. ^ "Indochina: Tough Times on the Trail"', Time Magazine, 8 March 1971. ^ Fulghum and Maitland, p. 76. ^ Nalty, Air War, p. 262. ^ Fulghum and Maitland, p. 78. ^ "Indochina: The Soft Sell Invasion", Time Magazine, 22 February 1971. ^ Fulghum and Maitland, p. 82. ^ Ironically, the two pilots were not recovered by the search and rescue effort that had abandoned the firebase. They wandered in the jungle for two more days before being picked up. Nolan, p. 150. At a meeting held at Dong Ha between Generals Sutherland and Dong, the Airborne commander railed against Lam and the Americans for not supporting his forces adequately. He was supported in his allegations by Colonel Arthur Pence, the senior U.S. advisor to the Airborne Division. Sutherland, infuriated by Pence's open support of Dong, relieved him of his duties. Nolan, pp. 145–150. ^ a b Fulghum and Maitland, p. 85. ^ Fulghum and Maitland, p. 85. See also Prados, p. 341. ^ Gloria Emerson, "Spirit of Saigon's Army Shaken in Laos", The New York Times, 28 March 1973. William D. Morrow, Jr., an advisor with the ARVN Airborne Division during the incursion, was succinct in his appraisal of North Vietnamese forces – "they would have defeated any army that tried the invasion." Prados, p. 361. ^ Victory in Vietnam, p. 372, 4ff. ^ Hinh, pp. 100, 103. ^ Henry Kissinger, The White House Years. New York: little, Brown, 1979, p. 1004. See also Phillip Davidson, Vietnam at War. Novato CA: Presidio Press, 1987, p. 646. ^ The new bases were named for actresses whose names American aviators would be familiar with: Gina Lollobrigida, Sophia Loren, Elizabeth Taylor, and Hope Lang. ^ By the time this request was made, South Vietnam possessed only one Marine brigade in its entire national reserve. Thieu responded to Abrams by requesting that U.S. forces be deployed to Laos, knowing that such an option was impossible. Sorley, p. 255. ^ Earl H. Tilford, Setup. Maxwell Air force base AL: Air University Press, 1991, p. 203. ^ Truck sightings in the Route 9 area reached 2,500 per month post the offensive, numbers usually seen only during peak periods. Prados, p. 361. ^ a b Nalty, p. 273. Hinh, Major General Nguyen Duy, Operation Lam Sơn 719. Washington, D.C.: United States Army Center of Military History, 1979. Military History Institute of Vietnam, Victory in Vietnam: A History of the People's Army of Vietnam, 1948–1975. Trans by Merle Pribbenow. Lawrence KS: University of Kansas Press, 2002. Nalty, Bernard C. Air War Over South Vietnam: 1968–1975. Washington, D.C.: Air Force History and Museums Program, 2000. Nalty, Bernard C. The War Against Trucks: Aerial Interdiction in Southern Laos, 1968–1972. Washington, D.C.: Air Force History and Museums Program, 2005. Van Staaveren, Jacob, Interdiction in Southern Laos, 1960–1968. Washington, D.C.: Center for Air Force History, 1993. Davidson, Lieutenant General Phillip, Vietnam At War: 1946–1975. Novato CA: Presidio Press, 1987. Fulghum, David, Terrence Maitland, et al. South Vietnam On Trial: Mid-1970 to 1972. Boston: Boston Publishing Company, 1984. Haig, Alexander M., Jr. Inner Circles: How America Changed the World, A Memoir. New York: Warner Books, 1992. Issacs, Arnold R., Gordon Hardy, MacAlister Brown, et al., Pawns of War: Cambodia and Laos. Boston: Boston Publishing Company, 1987. Kissinger, Henry, The White House Years. New York: Little, Brown, 1979. Palmer, Dave Richard (1978). Summons of the Trumpet: The History of the Vietnam War from a Military Man's Viewpoint. New York: Ballentine. Plaster, John L. Secret Commandos: Behind Enemy Lines with the Elite Warriors of SOG. New York: Simon & Schuster, 2004. Prados, John, The Blood Road: The Ho Chi Minh Trail and the Vietnam War. New York: John Wiley & Sons, 1998. Sorley, Lewis (1999). A Better War: The Unexamined Victories and Final Tragedy of America's Last Years in Vietnam. New York: Harvest Books. ISBN 0156013096. Stanton, Shelby L. (1985). The Rise and Fall of an American Army: U.S. Ground Forces in Vietnam, 1965–1973. New York: Dell. ISBN 0891412328. Emerson, Gloria. "Copters Return from Laos with the Dead." The New York Times, 1971-03-03. Emerson, Gloria. "Spirit of Saigon's Army Shaken in Laos. ", The New York Times, 1971-03-28.